Wild horses gather around water provided by BLM after the Tahokum 2 wildfire burned a portion of the Fox and Lake Range Herd Management Area, located north of Reno, Nevada. BLM photo. The Bureau of Land Management on Nov. 15 will begin a helicopter roundup of about 200 wild horses from the Fox and Lake Range Herd Management Area about 20 miles south of Gerlach, Nevada. Brought under control in September, the Tohakum 2 wildfire burned 27,000 acres on the 177,724-acre herd management area, including an area that BLM says contain two critical water sources. Writes the BLM in its planning documents, “Although the majority of the HMA was not burnt by the fire, the excess wild horses within the fire boundary continue to stay in the area identified for [emergency stabilization and rehabilitation] treatments. They have been and will continue to negatively impact fire rehabilitation efforts within the HMA as the horses are continually looking for food and water sources. 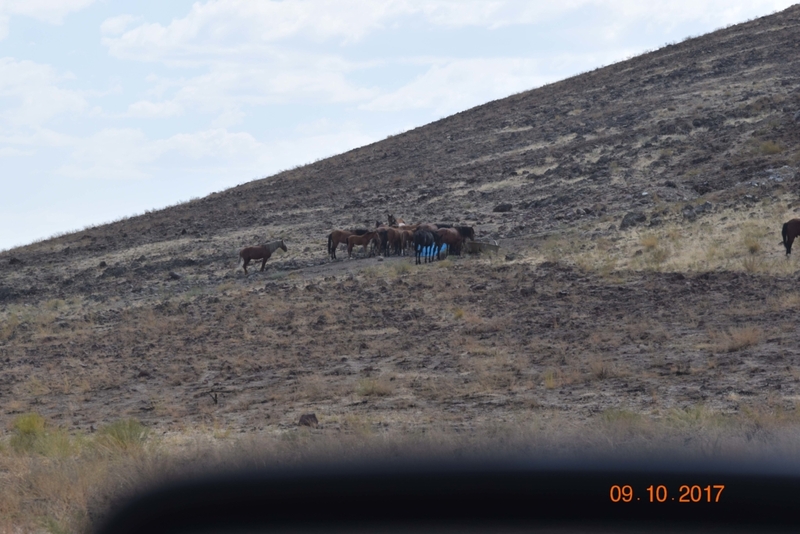 Wild horse grazing will hinder success of the fire rehabilitation efforts for the Tohakum 2 fire. In March, BLM estimated the wild horse population at the HMA at 530 wild horses, not counting foals. The agency’s “appropriate management level” for the HMA is 122-204 wild horses.